I recently had to develop another newsletter template for a client of mine. This sounds like an easy task but believe me, it's far more complicated than developing an HTML page. One would think that over the years HTML and CSS standards would have found their way into email clients. Reality is that the situation has got even more complicated. More email clients have seen the light of day with the smartphone revolution. Many of these supporting modern responsive design features but also still lacking key features or having bugs. 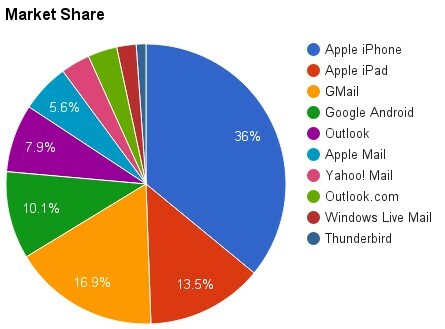 Modern Apple iPhone and iPad email clients combined seem to own almost half of the market. At the same time, desktop email clients such as Outlook are still well established but hardly supporting any modern CSS. This leads to the strange situation that templates have to be developed in a mixture of 90's style HTML using tables for layout and mixing it with modern CSS3 to make them work on mobile clients. I suggest you do not start developing your email template from scratch or you could quickly find yourself at A&E with serious head injuries caused by excessive banging your head onto the desk. While your template probably looks great in a browser you will find that it looks no-where near what you anticipated on Outlook or webmail clients. Chances are that you are using a service like MailChimp or Campaign Monitor. These services are not just great for merging and sending newsletters. They also come with a heap of pre-tested templates which can be adapted to your requirements. You may not find quite exactly what you were after, but it is still better to compromise at this stage rather than trying something yourself which doesn't work. The next problem is: how do you test it? No developer can get hands on all email clients on the market. Even if you tested on most popular email clients, you would spend a lot of time doing so and tweaking your design. Fortunately, there is litmus.com. You send your email template to a dedicated Litmus email address and within seconds you can view screen grabs of your email on a wide range of devices. This though comes at a price. Litmus charges quite high monthly fees for their services not worth investing for small businesses who don't need to develop templates on a regular basis. If you want to develop an email template yourself, try to find a pre-tested framework to build on, for example Foundation for Emails 2. HTML developers can use this pre-tested framework and adapt it to their needs (such as colours, logo etc) within short time without having to to go through a lengthy testing process which can can be quite a significant hurdle to take. If you would like help developing email or adapting email templates for your newsletter service, contact Marco at Nomon Internet Solutions. Nomon Internet Solutions. Powered by Blogger.